Wales will still have four professional teams after potential major changes to its regional rugby structure but mergers between existing sides have been discussed, according to documents seen by BBC Sport Wales. 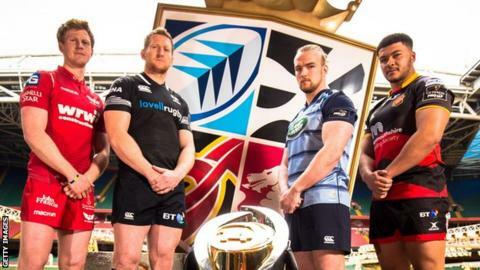 Plans for change from the 2020-21 season include a possible north Wales region and reducing professional sides in south Wales from four to three with the potential of two merging. Welsh Rugby Union chief executive Martyn Phillips confirmed this as a possibility during his meeting with the Welsh Rugby Players' Association (WRPA) and senior players - including Wales captain Alun Wyn Jones - on Tuesday. Phillips addressed WRPA following a request for clarity and consultation over ongoing discussions about the future of Welsh rugby. The minutes of the meeting read: "M.P. [Phillips] detailed that there have been ongoing detailed discussions within the Professional Rugby Board (PRB) about this matter and that all potential options had been explored, including the merger of regions. "At this time these discussions have not yet concluded however, one clear decision had been made, this was that there will continue to be FOUR rugby regions in Wales as this was seen as the necessary sustainable model. "What HAS NOT been decided upon is the final geographical location of these regions. This is subject to ongoing discussion." As well as confirming those regional changes as "potential options", the documentation of the meeting also reveals players - rather than the regions or WRU - would have to pay their agents' fees while negotiating new contracts. "Currently up until the new agent's proposal is agreed and signed off, the player is responsible for the agent's fee," the WRU's minutes read. "From today's meeting a query will be raised with the WRU to see whether a player could as part of his contract negotiation include a clause that agents fees could be settled after the WRU proposal is ratified." The proposed changes, dubbed Project Reset, will also see an end to dual contracts - funded jointly by the WRU and the regions - and introduce pay banding for players. Delays have led to problems for players in contract negotiations, with Wales and Ospreys skipper Jones among those whose current deal expires after the 2019 World Cup. "It has been dragging on, that's the most frustrating element," said Dragons back row forward Lewis Evans, who was at the meeting. "As players we just want to know where we are. There are boys out of contract and they have mortgages to pay. "The WRU heard our perspective and we just have to get something sorted as soon as possible so that we can all move on. "The whole process has been tough because you have to keep a lot of parties happy. "There are going to have to be some adjustments but as players we just have to back the WRPA and hopefully something can be resolved soon."